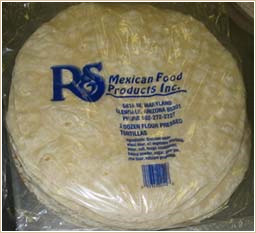 The Press Tortilla is the newest addition to our family of tortilla products. We use only the highest quality ingredients and all our White Flour Press Tortillas are made to your order because we deliver fresh! This is a great table tortilla and also excellent for those big, generous burritos your customers love! Specially formulated for your ease of use and durability under the toughest restaurant conditions we refuse to sacrifice natural flavor to meet these conditions. We think you will agree. There just isn’t a better tasting Press Tortilla available in Arizona! Just call us for samples. Please continue to scroll down to view a detailed product list of all our Press White Flour Tortilla products. 222060 Flour Press White 6"
222080 Flour Press White 8"
222100 Flour Press White 10"
222110 Flour Press White 11"
222120 Flour Press White 12"
222150 Flour Press White 15"